I remember the Easters we used to have when my grandmother was still with us. She would bake and cook and really make it special for us. In her garden loads of painted eggs where hidden & we'd have matzes. We will have some today aswell, with butter and sugar, really nice. We have butter lambs, butter pressed into a mold to look like a lamb. In the photo above. With box ears, raisin eyes and a red ribbon to symbolize the blood of Christ. Grandma made those for us too years ago. It was always an abundance of delights, love and warmth at her home. Something we also strive for here at Pale Rose Cottage. Mom's crochet eggs are hanging from a special holder in the center of our dinner table. (See second picture) I really like those, they have such a vintage feel to them. We ate egg on toast for breakfast, well I did anyway. It was all very nice and cozy, very Easter like. 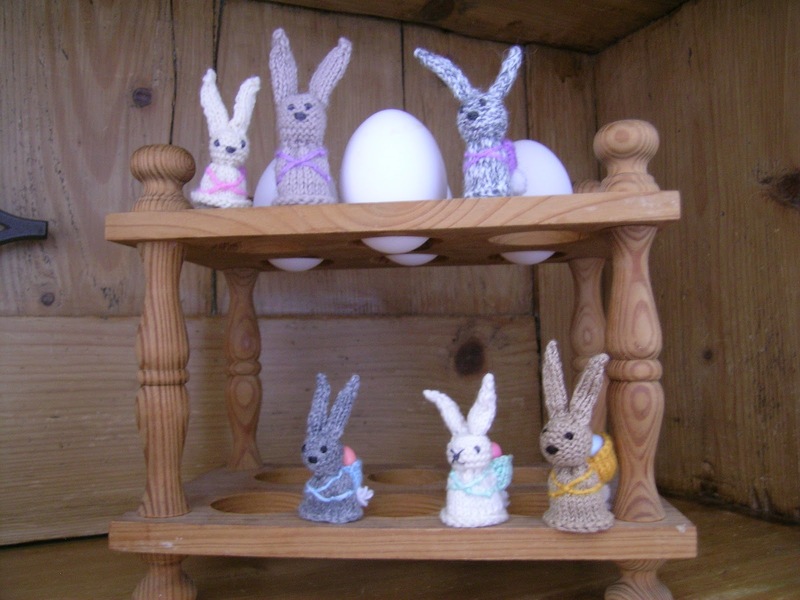 This year we have knitted bunnies on display, that I made (many years ago) for my mom as a gift. They are rather small and so they fitted perfectly on our egg stand. Chloë and Charlotte have left them alone, so that is good. The bunnies are all carrying little backpacks in which a tiny wooden egg is nestled. Aren't they fun? A few days ago we all watched a cookery show on tv. They made lots of Easter treats, spicy Easter cookies, Hot cross buns, a lemony Pavlova with Easter eggs on top... It looked delicious, the kitchen in which it was all prepared was in pastel colors and loads of daffodils brightened the setting. I really loved the interesting bits in between the recipes, in which I learned that Hot Cross buns have been around since forever & that the cross symbolized the four seasons, not so much the church. I also found out that you can eat primroses & this is something I would love to try myself. We do not have any primroses growing in our garden here at Pale Rose. But I will remember it next time we visit the garden center & maybe purchase a pot. I had recorded the program and we might watch it again, if everyone agrees. There will be little else to see this evening anyway. Sadly Easter movies or documentaries are pretty much non existent. Oh well, we could always just talk and catch up over tea. Are you dying to find out about my Kulich? Well, I'm sitting here with a BIG smile on my face, it went amazing. We had turned up the heat and measured all the ingredients. I lined the three bean tins with baking paper, this was a bit tricky but once I figured out the easy way to do this it was no problem. Then we started baking, mom helped me by preparing the filling and reading the recipe. It was a lot of fun to do together and we chatted and drank some tea in between the long waiting periods. In the next picture you can see that I formed the letters XB on top of each Kulich. This means: Christ is Risen. I was excited and a teeny tiny bit anxious about how it would turn out. But they did beautifully. The doubled in size, smelled good and when I had placed them in the oven they mushroomed in their tins. You know, their tops puffed up and started to resemble a mushroom. How do you say that in English? So, I will leave you for now. The Easter celebration is going on without me & I don't want to miss another minute. I will be back soon, I promise. Again I wish you all a very Happy Easter & tell me all about yours in the meantime. Would love to know how you celebrated!